There are so many reasons you may find yourself wanting to improve your online reputation. So in order to begin the process of reputation management, we must identify areas to improve upon. The first step in the Reputation Management process is Information Gathering because we must properly identify the problem! Chances are because you’re reading this, you may already be aware of potential problems needing reputation management. None the less, we must conduct thorough research because it’s essential to identify ALL problem areas when Information Gathering. Because this is the digital age, on a daily basis all of our data is being mined! Today, the average person’s picture is taken unknowingly 75 times. The choice, let alone the possibility of living privately, and with anonymity, no longer exists! Don’t worry! We Still have options! Just because it’s impossible to keep ourselves entirely out of public view, the game isn’t over, it merely changed! So now our strategy shifts to offensive rather defensive. despite Sun Tzu’s famous quote being of archaic origins, it still holds true. That being said, to effectively conduct our Information Gathering, we need to fully identify our potential enemies! The two powerhouses with some of our most secure information are LexisNexis and Neustar. Lexis Nexis controls a collection of our most secure billing, renting, and background information. Neustar has been enabling corporations and government bodies to obtain cellular information since 1999. Some of the most closely guarded secrets about you and your identity are held by the alpha omega two. Accurint’s Lexis Nexis is a secure record database utilized by government, Banks, Private investigators, and insurance companies. Luckily, Because this is secure and confidential information only negligence typically causes a leak. Well, minus incidents like Five People Hacking in and one other Hacker. Doesn’t really matter how secure that is when the era of cellular devices has come to fruition. Since 1999 Neustar has been monitoring every cell phone in the world. Today, every single phone conversation is recorded and used for data mining. So minus a high-level hacker or big brother, the alpha omega’s won’t be the culprit to leak information. Sure, everyone loves to point the finger at the judicial system. But any solid information gathering makes it easy to conclude the contrary! So without further delay, I introduce the nine spies! These companies generally don’t have the ability to do their information gathering by accessing directly from the source. They all have their own methods to trap your data so they can sell it. Because Generally, their intentions are to provide data for marketing research purposes. So, bear in mind while information gathering any data left lying around has the potential to harm you. Furthermore, don’t ever accept defeat if there is a will, there is a way! Especially because this is a fight that with my knowledge you’re certain to win every time! Let us make our way now to the causes of our data leaking now that we have studied the source! The most likely places we will first identify slander from our information Gathering leaked is naturally a location we frequent. be amongst So the first and obvious place to look would be a search engine. When conducting search queries during your information gathering, there are a few query strings that can aid you. Because we want to be somewhat thorough, here is a chart to help you in your research process! Information gathering by conducting a query search in Google, you’re sure to see the information you don’t want publically available. Chances are this scattered collection of information was left by a member of the category indirect reputation harm. Culprits cause Indirect Reputation management harm as a result of negligence or lack of regard for private citizens and our right to privacy. Many likely candidates populate search results during our Information Gathering. The good news is the majority have a process in which your data can be removed. (9 Spies In Gold). NO Requires Mail/Fax Request with image of Photo I.D. So much more difficult and challenging is dealing with Direct Reputation Harm when Information Gathering. Because removing accidental or unintentional content that damages our reputation is substantially easier to remove. Sometimes it’s so subtle and overlooked as false information on social media, or perhaps negative reviews entered into directories. Because entities like Google advise us to be prompt and respond to the complaints, that is the action we must take. Furthermore, defending you/your businesses reputation in a professional manner, it shows integrity. It shows other potential customers you make efforts to correct situations so they’ll have faith in you. Take great caution in this trouble area because it’s where we’re treading upon the dangerous ground! You know the friend, or former lover better than me obviously so use your best judgment. Furthermore, I will say that situations involving someone once close to us, can have dangerous to fatal consequences. A common example of reputation slander can be minor libelous statements or shaming. Shaming involves the former partner taking intimate photos or video footage and putting it up online. Fortunately, because the source of this type of humiliation is a spouse or former lover it is uncommon. One can assume because it is a substantial criminal offense, most tend to avoid slandering people as such. Because certainly, nobody wants to go to jail with any form of sexually related crime! The third and highest level of intentional damage to our reputation management process, you should never approach. Because all the knowledge and information gathering in the world won’t prepare you for your first encounter! Criminals ever so ruthless and without morals such as Jason Joseph Watson, or Edmund Tauk. I speak of someone who is a calculated surgically precise individual who uses social media and search engines to cause lasting damage. Prepare yourself! A quote from the book The 48 Laws of Power, “So much depends on reputation. Guard it with your LIFE!” In the illustration, two Samurais can be seen in a duel to the death. To a samurai, your name and your honor were worth more than money and even life itself! Professional Extortionist, Ruthless, Moralless Social Parasites! Robert Greene drives it home with this law, but not because you want this fight. Because assure you, no matter how many fights you’ve been in, no matter how much of a killer you think you are, walk away! I made this mistake, and because I had no idea how selfish of a decision it was, I’d advise against it. Because these people will hurt you, your friends, and your family! So understand they live with absolutely live with no morals or ethics of any sort! So exercise restraint! Because If you have kids, they won’t hesitate to spin up a story to get CPS involvement. Furthermore, they’ll threaten your friends and family, and they’re pros at destroying lives! Because having been to prison living amongst killers, I can tell you these people are bad news! So know the enemy, and concede to the fact, that for them to have thrived in this industry they are intelligent. Just because I’m a nondangerous non violent drug offender, there are millions amongst their slander victims. Furthermore, even some of the drug dealers I knew would have killed anyone in a blink! So we must concede that our attacker has to be smart! Because if he makes so much as one mistake with 15 million potential felons possibly showing up to kill him, he’s f**ked! So in conclusion, we’re dealing with a trained, expert criminal. Because they’re hackers, fraudsters, and social engineering masterminds embedded into multiple layers of society protecting their locations and true identities! For me it’s too late, but not for you! That Bridge has been crossed unfortunately for me lol! Because I drew my sword, I will see this out to the end! If I could go back to the day I shook the hornet’s nest and stop myself I would. So learn from my experience by not engaging these individuals, but rather pick up the pieces and move on! This isn’t about money, financial gain, sure I have to eat who doesn’t! What this is about entirely is stopping a person from ruining millions of lives and harassing and torturing people! So if I persuaded you to not contact these criminals, then I couldn’t feel more accomplished! Because I assure you, if you think paying extortion money is the solution, you’re just the meal ticket they’ve waited for! Because these criminals I’ve conducted information gathering on for years have 100s of domains. 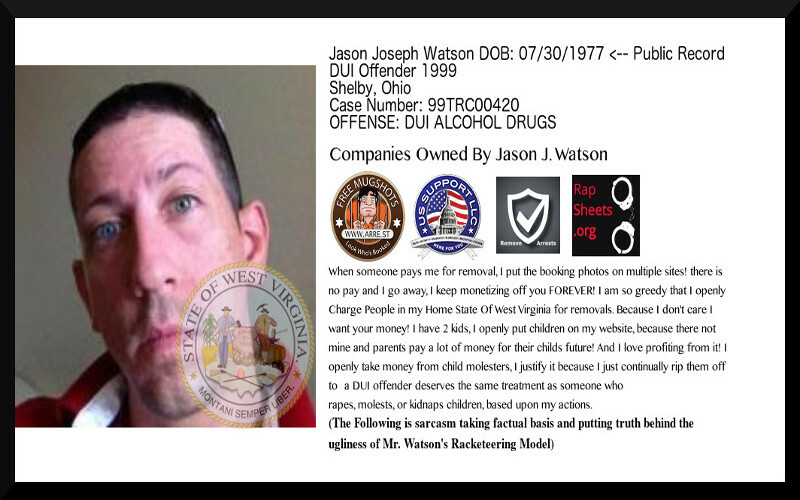 Jason Watson’s a man that criminally steals VIN numbers to conceal his location and identity. Information Gathering and Reputation Management are an ongoing process. So keep that in mind that your reputation is a daily proactive process. So an excellent way to protect yourself from incoming hazards is to handle them right away. But because we can’t see everything all the time, what should we do? A great question that deserves a great answer so two words, Google Alerts! Because having an alert trigger as soon as something is found in your name, is an invaluable tool to have! That’s enough for today, Part II begins our offensive strategy to defend or take back our name!